It’s hard to come up with the right words to review “Hellbound”. It was even better than book one in The Lost Souls Trilogy. The characters come alive in this book and I was just caught up flipping the pages. This book just has so much going on and I have so many feelings about it. I can’t give too much of the story away as so much of this book would spoil the series for you. So I’ll leave you with this. This is the kind of book that makes me want to read! This is the kind of story that will knock your socks off! 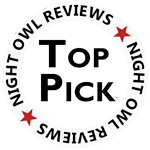 5 STARS / TOP PICK! New York City, 1975 Chez Monique, New York City s premiere destination for French cuisine takes center stage as Alden Murphy, a young Irish immigrant, seeks to build a new life for himself amongst his eclectic (and eccentric) coworkers. However, his pursuit of the American Dream takes a dark turn when powerful forces author horrific tragedy to shape Alden into the man he is destined to become. Los Angeles, Present Day Still reeling from saving her mother s soul, Christa Nicols has a lot on her mind. A homeless guardian angel. A demon with a score to settle. A science fair presentation... oh, and a divine prophecy that says she ll forever change the afterlife. Her questions are in abundance, but with a civil war in Hell brewing; and the demonic feast day of King Herod looming, Christa doesn t have much time to find answers. Sins of the past and troubles of the present collide in Hellbound, book 2 of the Lost Souls Trilogy.